960px - commonly used on desktop sites. fluid - more often seen on mobile sites for full width display. 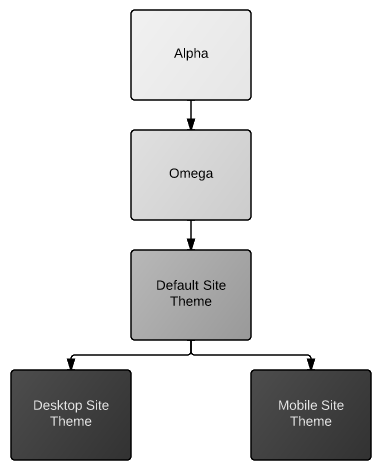 Since it was desireable to have a 960px grid for the desktop site and fluid grid for the mobile site yet also both desktop and mobile subthemes had to inherit basic CSS from the Default Site Theme (background colour, text colour, margins/paddings etc) the default theme must have CSS files for the subthemes to inherit from. A fluid theme will not inherit anything from the custom basetheme if there are no fluid CSS files in the custom basetheme. The same is true of 960px subthemes. The default (960px grid CSS file) can also have -wide and -narrow derivatives, responsive to @media queries. Within the settings for the subtheme, under 'Toggle Styles', the css file is ticked to be included. As usual, comments and questions below!